Tracking our net worth gives my wife and I a snapshot of our personal finances at a point in time. When we report our net worth numbers, we include our assets and our liabilities. For years we have been reporting on many of our assets, including our dividend income portfolio. At the time of this writing, we have built a cash flow machine that will generate over $2,000 in dividends next year. Every month we publish the latest monthly results for our dividend stocks to show how the portfolio is growing. While reporting these assets is great, one thing we don’t often discuss is our liabilities. And while we don’t carry a lot of credit card debt, or student loans – we still have a mortgage and car payment. Not to mention our monthly credit card balances. So when we report on our net worth, it gives us the opportunity to review both sides of our personal finances. Our assets (home value, investments, cash) and our liabilities (mortgage, car loans, credit cards). We are tracking our net worth through our Personal Capital account. This tool has made it possible for us to easily track our net worth at a moments notice. 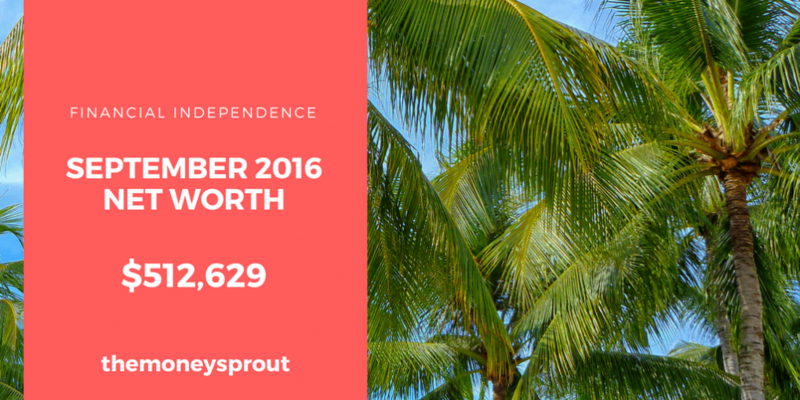 As of September 28th, 2016, our net worth is $512,628.79! I don’t really like to post these net worth updates every month, since there is little value in frequent updates. There are a lot of moving parts to calculating ones net worth, which is why monthly updates seem to be pointless. However, I do feel it is important to share our net worth progress 4 to 6 times per year. Doing so offers insight into several of our asset classes like investments. I like to see how our investments are growing – both by new money invested as well as capital gains. This also means that our net worth could decrease between updates. So here is our most recent update, compared to our last net worth post back in July. Our net worth in September 2016 rose by 2.3% compared to July (2016). That is an increase of ~$11,400 over the past 2+ months. We currently have 3 main asset categories that we are reporting on – investments, cash, and home value. We don’t like to report our automobiles as an asset, so those are only included as liabilities (for our minivan). This category includes our dividend income portfolio, 529 plans for the kids, emergency fund accounts, retirement accounts, etc. It is currently our highest valued asset and we are constantly working every single day to make it grow. Up until July, we had been investing a lot of new money into dividend stocks. However, the last couple of months we have not been as good about pumping up our investments. We wanted to try and build our cash balance and also make sure we had enough to pay off some debt. Despite not investing a lot of new money into the stock market, the value of our investments still rose by 1.6%. The majority of the increases were from capital gains as the stock market continues to rise. There were also a lot of dividends reinvested back into new shares of stock. Overall, the health of our portfolio looks strong as we have built a solid cash flow machine. We saw a huge spike in our cash balance of almost $2,000. We decided to let our cash balance build up the last 2 months in order to pay off some debt – which you will see in the liability section below. It is hard to put much confidence in these housing value numbers. At this point, I am not sure we could sell our home for $327,000 or not. That number is just an estimate based on similar homes that have recently sold in our area. Despite the limitations of reporting our home value, it is neat to compare our home value estimate against our outstanding mortgage balance (approx. $185,000). Overall, all three of our assets we report on (home, investments, and cash) saw modest increases. That is always a good sign that we are slowly building our net worth. Total assets rose by almost 1.7% since last reporting. My wife and I have had a debate for some time. Rent or own a home? For our family, it just makes more sense to own and have a mortgage. Once our kids have grown and move out, then I would prefer to rent. But for now, we own a home and are paying a mortgage on it. Our 30 year mortgage rate is 4.375%, which isn’t too bad. We have considered refinancing, but at this point the numbers don’t say it is worthwhile. So we continue to pay our mortgage every month. In the past, we had paid extra on our mortgage each month to try and knock years (and interest) off the loan. Based on our low interest rate, we now opt to put this money to work for us in the stock market. I like to think we can earn a dividend yield higher than our mortgage rate (4.375%). Every month we continue to pay down the balance on our auto loan. So it is no surprise to see a large drop in the balance. Our credit card balances fluctuate a lot month to month. However, the past couple of months we have taken on a lot more debt. As I noted in our asset section, we let our cash balance build up recently in order to pay off this debt. We always pay our credit card balances in full each month, so we are not paying any interest on this money. A couple summer vacations and some unexpected home repairs caused the spike up. Since last reporting, both our mortgage and car loan balances dropped – as expected. Our credit card balances went up a significant amount. Growing your net worth is not just about increasing your assets. It is just as important to lower your liabilities at the same time. The larger the gap is between your total assets and total liabilities is the key to financial independence and something my family is working towards. I never like to see our liabilities increase – which is what happened since last reporting. Now it is less than a $500 increase, which is more than offset by our large asset increase. However, it is a good wake up call for us to really focus on driving down our debt. Eliminating debt is just as important as building your assets when it comes to growing your net worth. We don’t post these net worth updates that often. Usually every couple of months we will put out an update. Our home value fluctuates so much that it just doesn’t make a lot of sense to report each month. However, we also think it is important to track our net worth so we can take a snapshot of our personal finances. It is fun to compare this year to last or in this case September and July. The goal is to see our assets grow each time we report and our liabilities decrease. This time we saw a big increase in assets but a slight increase in liabilities as well. Combined, our net worth still increased by a modest amount. Eventually, we would like to see our net worth top $1,000,000! But until then, I will take these small increases that we are seeing.